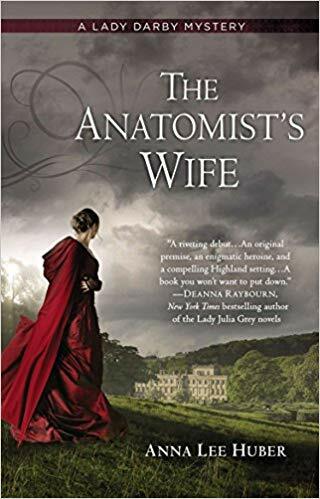 The Anatomist’s Wife, the first book in the Lady Darby Mystery Series by Anna Lee Huber, is a quick-paced mystery series set in Scotland. I enjoyed this first book and plan to read the rest of the series. Scotland, 1830. Following the death of her husband, Lady Darby has taken refuge at her sister’s estate, finding solace in her passion for painting. But when her hosts throw a house party for the cream of London society, Kiera is unable to hide from the ire of those who believe her to be as unnatural as her husband, an anatomist who used her artistic talents to suit his own macabre purposes. Kiera wants to put her past aside, but when one of the house guests is murdered, her brother-in-law asks her to utilize her knowledge of human anatomy to aid the insufferable Sebastian Gage–a fellow guest with some experience as an inquiry agent. While Gage is clearly more competent than she first assumed, Kiera isn’t about to let her guard down as accusations and rumors swirl. When I reviewed And Only to Deceive, I said that,” The mystery is interesting, but quite slow. It is probably about half-way through the book that Emily begins to understand there even is a mystery to be solved.” Not so here. The Anatomist’s Wife opens with a murder, and Lady Darby square in the middle of the scene. The action is quick and engaging. The mystery is well-written and well-paced, if a bit predictable in places. One of the things that drew me to this series was the Scottish setting, something that would be different from the American and English mysteries I usually read (here, here, and here). However, the Scottish setting doesn’t really add anything to the story. It could have been set in any countryside and the story wouldn’t have changed a jot. The other books in the series also take place in Scotland, so it will be interesting to see if they setting plays a larger role in the future. The character of Lady Darby is interesting. I like the descriptions of her working on her art because they remind me of my life as a writer. All creatives go through similar processes of creating. The meta-mystery of Lady Darby’s odd late-husband is also interesting. The questionable methods doctors used in the past to learn more about the inner workings of the human body are always tantalizing, and Lady Darby’s education about the body (both alive and dead) was a good setup for how a Victorian-age woman would end up helping solve murders. Her backstory is both fantastical and realistic. I don’t care for the “love interest” of Mr. Gage. He isn’t particularly interesting or attractive. I hope Lady Darby finds someone more worthy of her attention. Have you read The Anatomist’s Wife? What did you think?